An urban wedding can come in all sizes – from the intimacy of small gathering in marriage halls in Chennai, to enormous industrial lofts and imposing ballrooms in hotels. Top wedding planners in Chennai will know that what unites ties together the style is a clean, cosmopolitan, and slightly futuristic approach towards the decorations. 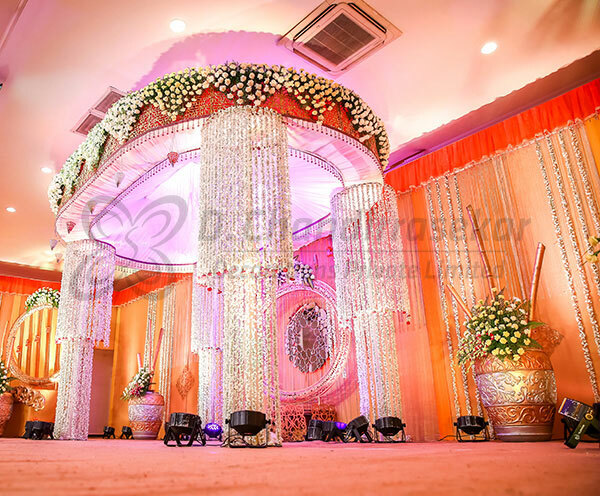 D.Chandirrasekar Decorations can accomplish this very look with a variety of sleek variations to suit all budgets. In fact, for households with limited resources, want to deviate expenses to some other aspect of the wedding or simply prefer a cleaner look, this pared-down look makes one striking style statement. Getting the decorative settings right comes second to the actual costume preferences of the bride and groom. This look especially suits a more laidback, western style wedding. D.Chandirrasekar Decorations will not only look after the catering and provide you with a list of marriage halls in Chennai with costs for you to choose from, we will also find the best Christian wedding gowns in Chennai for you to help you save time and money. As far as wedding stage decoration goes, this look allows multiple layers of similar-coloured objects to form a unique patina. It also makes use of chandeliers, soft white drapes and oversized vases and columns. Symmetrical repetition and soft pastels brought out by sudden pops of gold are what create a seamless, Grecian air that not only makes small marriage halls in Chennai look larger but will give importance to the things that really matter – the newlyweds and the people. D.Chandirrasekar Decorations will also source marriage catering services in Chennai and other localities. Though locality-based food is generally served at a wedding, we will go the extra mile to conjure special delicacies at the request of the wedding parties – all this to make sure you are 100% satisfied with our services. We are not your run-of-the mill wedding planners in Chennai. At D.Chandirrasekar Decorations, we understand that each wedding is only one of a kind, meant to reflect the two families who have joined as one through matrimony. We take this into account for every aspect of the planning and to honour the fact that each family is a little different, we give you our promise that we will strive to make your wedding uniquely you.